A groundbreaking and revelatory history of psychotropic drugs, from "a thoroughly exhilarating and entertaining writer" (Washington Post). Although one in five Americans now takes at least one psychotropic drug, the fact remains that nearly seventy years after doctors first began prescribing them, not even their creators understand exactly how or why these drugs work--or don't work--on what ails our brains. Blue Dreams offers the explosive story of the discovery and development of psychiatric medications, as well as the science and the people behind their invention, told by a riveting writer and psychologist who shares her own experience with the highs and lows of psychiatric drugs. Lauren Slater's revelatory account charts psychiatry's journey from its earliest drugs, Thorazine and lithium, up through Prozac and other major antidepressants of the present. 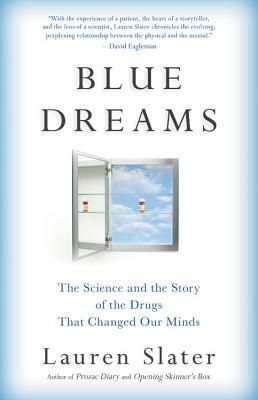 Blue Dreams also chronicles experimental treatments involving Ecstasy, magic mushrooms, the most cutting-edge memory drugs, placebos, and even neural implants. In her thorough analysis of each treatment, Slater asks three fundamental questions: how was the drug born, how does it work (or fail to work), and what does it reveal about the ailments it is meant to treat? Fearlessly weaving her own intimate experiences into comprehensive and wide-ranging research, Slater narrates a personal history of psychiatry itself. In the process, her powerful and groundbreaking exploration casts modern psychiatry's ubiquitous wonder drugs in a new light, revealing their ability to heal us or hurt us, and proving an indispensable resource not only for those with a psychotropic prescription but for anyone who hopes to understand the limits of what we know about the human brain and the possibilities for future treatments. enormously poetic and ebullient writer."